One of the most common treatments for breast cancer is chemotherapy. Chemotherapy, simply put, is chemical therapy, and it is a very effective medicine for weakening and destroying some of the cancer cells that are in the body. 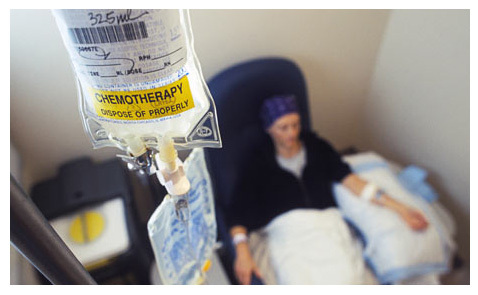 Chemotherapy not only targets cancerous cells that are at the original site of the breast cancer, whether that be in the lobules or another site in the body where the cancer has originated, but also targets cancer cells that have moved to other parts of the body, making it a great combination treatment with surgery, which removes as much of the cancerous growth as possible. Combination of DrugsChemotherapy is not a particular drug, but is almost always a combination of several drugs. In fact, your doctor may try different combinations of drugs to slow the growth of the cancer or eliminate it from the body, because everyone reacts differently. There are actually more than fifty different chemotherapy drugs, which can result in thousands of combinations, and obviously, not only does each person have a slightly different reaction to the drug combination when it comes to treatment, but each person’s side effects are different as well. Some of the common chemotherapy drugs include cyclophosphamide, docetaxel, carboplatin, doxorubicin, and imatinib mesylate among many others. There are many different side effects associated with chemotherapy drugs. Some of them are specific to just one drug, and others are experienced from two or more different drugs. Also, some side effects are only present during combinations of certain drugs. That is why it is important to keep your doctor informed of any and all side effects you may experience. Some of the most common side effects include blood cell count decrease, nausea, vomiting and low blood pressure, although usually just when the drug is being administered, as well as an allergic reaction, flu-like symptoms and diarrhea, along with dry mouth, dry skin, increased sensitivity and hair loss, which is usually reversible once the drug treatments have stopped. Chemotherapy comes in quite a few different forms. Your doctor will explain to you which drugs you will be taken, and the dosage of each one, and where they will be taken, as well as what side effects you might experience. Some of these drugs you will be responsible for taking yourself, and others will have to be administered at your doctor’s office, or some other medical care facility. Some of the drugs that you will be taken may be injected into your veins, as well as into the muscle, and still others are placed right at the site of the tumor. Also, some medication is required to be taken in the body cavity, or orally as a pill. It depends entirely upon what your doctor prescribes and where your cancer is located. Chemotherapy is certainly not the magic formula to cure your cancer. It may work well, or it may not work at all, and your doctor will certainly try different combinations to see if improvements can be made. Certain cancers respond well to chemo and others are barely affected. Chemotherapy is just part of the treatment that your doctor will prescribe and it is important to remember that there is no cure for cancer yet. In early stage of invasive breast cancer before the surgery to shrink the cancer making it easier to remove or after the surgery to destroy any cancerous cells left, reducing the risk of recurrent breast cancer. In advanced stage breast cancer as palliative medicine, to prolong the patient’s life or to increase the quality of the remained life, destroying cancer cells as much as possible. However as medicine continues to advance and more and more is learned about the disease, more effective treatments are developed and if your breast cancer is in the early stages you stand an excellent chance of recovering from it completely.